Creamy coconut milk, naturally sweet bananas, and fresh B.C. cherries swirl together in this cool treat that offers guilt-free indulgence. Kissing sugar goodbye is a lot easier with ice cream like this! I’ve seen so many tempting ice cream recipes this summer, and I would love to try them all. Last week, however, I decided I needed to eat healthier so that I can keep wearing the same size clothing as last year. This naturally sweetened ice cream was the result. Because ice cream is a summer necessity, is it not? I also splurged a little with a drizzle of honey-sweetened fudge sauce and pecan topping. All my cold cravings were completely satisfied. Add coconut milk and bananas to blender jar. Cover and blend until smooth. 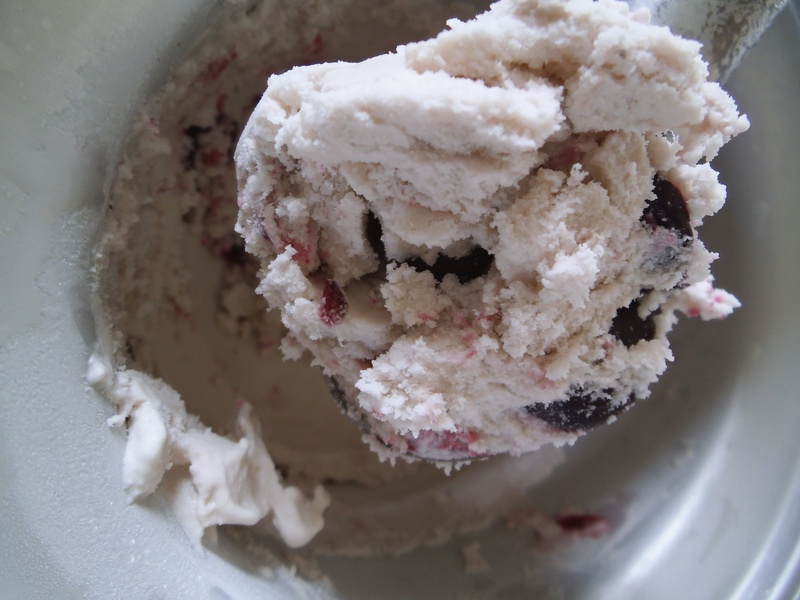 Pour into prepared ice cream maker* and churn for 15 minutes or until ice cream starts to thicken. Add cherries and churn for 5 more minutes. Serve immediately. Top with fudge sauce and nuts if desired. * To make no-churn ice cream, start with chilled coconut milk and frozen banana chunks. Blend until thick and frosty. Fold in cherries. Freeze until set. I’m sharing my recipe at Allergy Free Wednesdays and here. Thanks, Kelly! I am trying to eat healthier these days, but I hate feeling deprived. So this was the happy result. I love this dairy free, no sugar added treat! Looks delicious and I can feel good about eating it too. Thank you for sharing. Definitely going to try this one. I won’t even tell my husband it is good for him either! I bet he’ll never know. Looks great and very cooling. Thanks for linking up to Sweet and Savoury Sunday, stop by and link up again. Have a great day! !